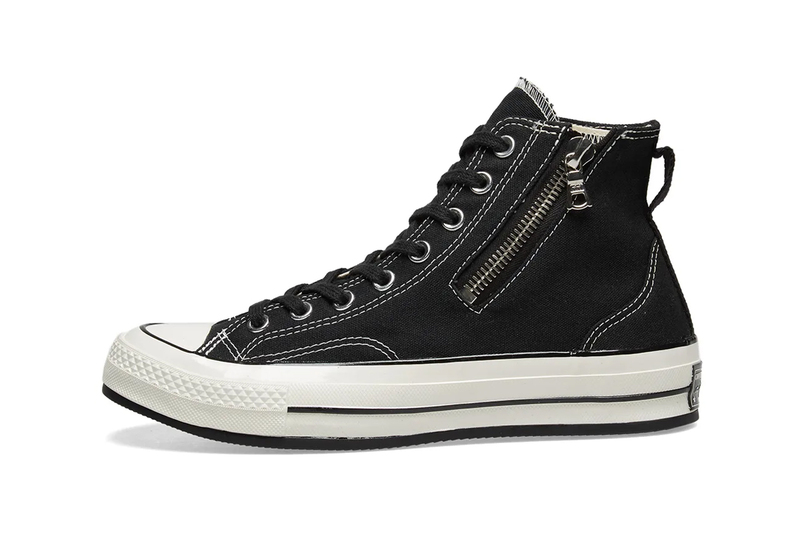 Continuing to offer updated takes on the classic Chuck Taylor All Star ‘70 Hi, Converse recently teamed up with Swiss zipper purveyor RIRI on a trio of standout reworks of the model. Available in “Sand Suede,” “Brown Leather” and “Black Canvas,” the footwear options feature luxe uppers elevated with heavy-duty details in the form of a side zip closure and a thick grosgrain heel pull tabs. Branding comes in the form of Converse All-Star circle patches tacked on to the medial sides and branded plates at the heels of the shoes. Cushioned OrthoLite® insoles, rubber toe caps, high foxing tape and vulcanized sole units serve to round-up the design of the collaboration. Priced at $120 USD, the RIRI x Chuck Taylor All Star ’70s are available now at END. Clothing. In case you missed it, the Converse GOLF le FLEUR* “Industrial” released with matching ’60s workwear jumpsuits.